Does anyone know, or maybe have the heart to check on your own ´58, the length of the spacer ( metal tube ) that sits inside the two isolators on the rear axle. After m u c h work on all possibilities I have located the problem with my stiff rear end and limited suspension travel to this area. My isolators are the original rubber, meaning they are very hard after +50 years, but I know that my spacers are not original, so I need to find out the original length if I ever is to have the rear suspension working properly. I need to find some real soft isolators also, in order to get this work as it should. On a bonus note, it would be interesting to know if you have the treads even to the nut or how far ( or how many treads ) you might have through the nut. I'll measure and take pictures of my '58 but won't get to it until weekend after this one coming up. I'm not quite ready to disassemble everything. What do you need to do to offload this isolator to remove it? Yes. It is quite simple and fast. But I recommend that you put notes on on the distance of the tread, so you can adjust it. Are we talking tread of the tire or do you mean thread on the bolt?? Bolt Just to give an estimation about how hard or loose they are adjusted. Looks like the sleeve is 2.5 inches or 6.35 cm from the picture. Do you have a measurement for the bolt? 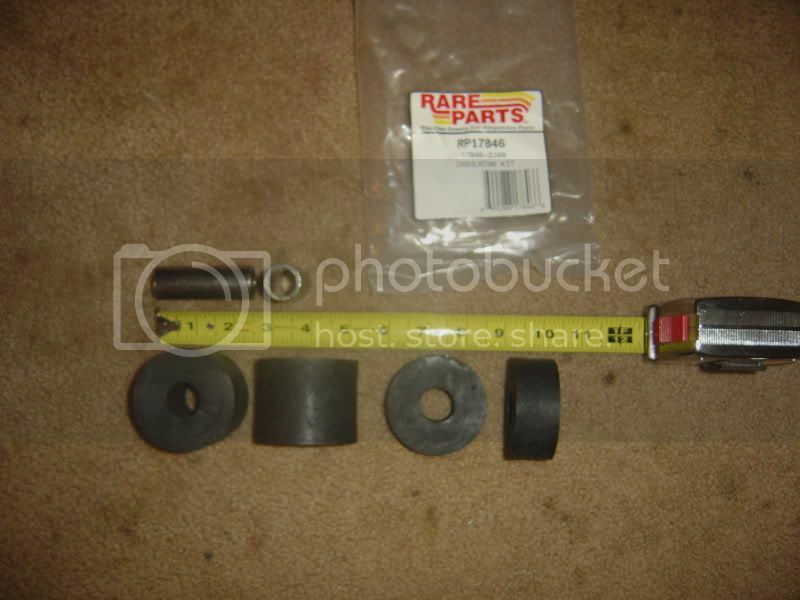 Do you also have measurements or pictures for the track arm bushings and the control arm? This is good stuff! Thanks. Mine are aftermarket, but what I realy like to know is how long is the original. Need to dig in and learn this as the whole travel set-up is done by this bolt. If I tighteen them as much as I can ( limiting the movement ), I have a travel of the rear axle of approx. 2" . If I loosen everything and take out the rubber isolators, My rear axle can move 2 feet up and down, so to find the right length and then hunt after some realy soft rubber to make new isolators from. When I bought my car, somebody hade put on super hard isolators. Like a hockey puck. No flex what so ever, meaning the stress transportated ( as the car tryed to move up and down while driving ) itself through the upper control arm, and created breaks in the framepart where the upper control arm sits. Unfortunally there is no words in the shop manual about how to adjust or where the "factory setting" is, or what shore the rubber shall have. Last edited by Anders; March 5th, 2011, 07:57 AM. Is the bolt you have a picture of an original? How long is the bolt and how far back is it threaded? Yes, the bolt and locknut is Original. Maybe we can collectively Reverse Engineer the length of this spacer (Item 5540). Has the bolt been replaced from the original one? My assumption is that the bolt has a larger diameter shank than the threaded portion of the bolt. Look at the attached diagram and see if my conclusions make sense when looking at the suspension assembly of your car. I think washer 55596 seats against the shank of bolt *45859-S, this keeps anyone from over-compressing the bushings. If that is true, than the length of your spacer 5540 is fractional shorter than the lenght of bolt *45859-S MINUS the thickness of the Axle Perch (part of 4010 axle housing), but long enough to retain the compressed thickness of bushings 5537. Also if washer 55596 or the bolt have been replaced by something different, that could change this connection from the way it should function. Looks like your bolt is different than my conclusion. I have a hardware catalog that I can check later this evening to see if the bolt is unique. If your bolt is the original design, than the lenght of the spacer would be fractionally smaller than the bolt shank lenght MINUS(-) the spring perch thickness MINUS(-) washer 55596 thickness. This would assume that your nut would be run up to the ends of the bolt threads. It appears the purpose of the spacer and bushings is to allow this connection to move side-to-side as well as up and down for suspension travel. Maybe someone else has some ideas after reading this. Added an additional sketch for clarity. Last edited by GTE427; March 5th, 2011, 02:19 PM. I didn't see the bolt specifications when i looked at the Text Catalog, thanks. Do you have a Standard and Utility catalog, what copyright? Last edited by GTE427; March 5th, 2011, 03:22 PM. Ford Group Numbers are kinda 'fuzzy' at best. Notice there is nothing about the bolt if you look for 5859, but it's there if you look for the whole assembly. In fact, there are three applications for the same bolt and nut in that assembly. I marvel when I think of the scheme Ford used waaaaaay back before we had computers... and we're still using it today. Before Carl helped me getting a set of used, but original Isolators and washer( 55596 ) I was long gone in making this work. As the parts I have now, the total length of the two isolators ( 5537 ) is longer than my sleeve. Having in mind that the sleeve also runs through the lower trailing arm and the isolators are on one side of it, it add little more "air". Now, I don´t know if this is the right length of the sleeve or not. I just don´t think it´s the right one as it is yellowish, as modern treaten metal parts. I am 99,99% sure my bolt is original though. It is the very same Ford split-lock-nut and the bolt look just like the others, but with it´s own length as the rest in the rear suspension. Why I am trying to figure out the right length is that it is a important input about how much the isolators should be able to compress. Bringing some more experianced friends having a look at this last Friday, we tryed every possible way to check every movement with and without attaching the coil springs, as we then could move the rear axle, and our conclusion was that the isolators most probably was way softer in 1958 than they have become since then But still. So if I only get hold of the "original length" of the sleeve, I can start chasing different shore of rubber to start trying what might work best. Last edited by Anders; March 5th, 2011, 05:02 PM.